(Nanowerk News) Masateru Nishioka, Catalysis Team, the Research Center for Compact Chemical Process of the National Institute of Advanced Industrial Science and Technology and K. K. Shinko Kagaku Kogyosho have jointly developed continuous production equipment for metal nanoparticles and have succeeded in the practical use of a process where metal nanoparticles are synthesized continuously with uniform quality. The continuous production equipment for metal nanoparticles is developed utilizing a technology for microwave flow reactors jointly developed by AIST and IDX Co., Ltd. Although it has been known that metal nanoparticles with a uniform size can be synthesized in a short time by applying microwave irradiation to reactant solution, the continuous synthesis suitable for industrial production has been difficult. AIST had developed a technology for applying a concentrated and uniform microwave to a tubular reactor by using a semiconductor microwave source. In this joint research, the irradiation technology was optimized for a metal nanoparticle synthesis and the safe equipment for the continuous synthesis of metal nanoparticles with stable quality was put into practical use. Because the conventional production of various kinds of metal nanoparticles has been carried out in batch operation, there are problems such as considerable time and effort required for maintenance including the change of reaction solution and washing in each batch, stability of quality, and the environmental load by waste water treatment. The equipment developed here overcame these problems and allowed the continuous synthesis and stable quality of synthesized metal nanoparticles. The details of this technology were exhibited at nano tech 2010 International Nanotechnology Exhibition & Conference, held from February 17 to 19, 2010, at Tokyo Big Sight. Microwave control unit (left) and irradiation part (right) of continuous production equipment for metal nanoparticles. Metal nanoparticles are used as materials for the wiring on flexible substrates and row materials for catalysts and medical test reagents and are also widely used for the development of electrode materials so as to improve the performance of secondary cells and fuel cells. Thus, the development of various kinds of metal nanoparticles has been promoted. Under such circumstances, the production cost and stability of the product quality of metal nanoparticles have become important and mass production technology and continuous production technology have been anticipated. For the production of metal nanoparticles, various methods including gas-phase methods and liquid-phase methods were proposed and the metal nanoparticles are actually produced by some of these methods. Since the amount of metal nanoparticles used has increased in recent years, requests have been increasing not only for quality but also for matters of environmental loads, such as energy consumption in production, reduction in CO2 emissions, the amount of raw materials, minimization of the amount of byproducts, and waste water treatment. Microwaves help in the rapid and direct heating of substances and are implemented in microwave ovens. Recently, research on the application of microwaves to chemical processes such as the synthesis of organic compounds has been actively performed. However, since microwaves, one of the electromagnetic waves, often involve non-uniform irradiation, the energy intensity at reaction sites becomes irregular and the reproducibility of reactions is poor. Under present circumstances, the reproducibility of reactions is obtained by stirring the reaction solution to realize uniform microwave irradiation. AIST and IDX have jointly carried out the research and development of a microwave irradiation technology that allows generating the uniform electromagnetic fields at reaction sites without the stirring mechanism. 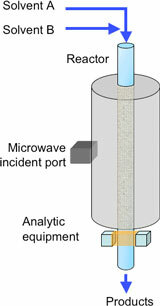 As a result, even uniform microwave heating in reactions using catalytic packed-bed reactors was achieved by the technology because stirring mechanism is not required. Applications to gas-phase chemical reactions such as the rapid decomposition of volatile organic solvents discharged from paint factories were demonstrated. Shinko Kagaku Kogyosho has produced noble metal nanoparticles by batch methods and has had concerns about the increase in the production cost and stability of product quality because some processes including the change of materials and washing rely on manpower. Therefore, Shinko Kagaku Kogyosho has been seeking a new metal nanoparticle production method that allows increased production meeting to the expansion of metal nanoparticle application, the improvement in the stability of product quality by automating the synthesis process, and the ensured traceability. Consequently, Shinko Kagaku Kogyosho determined to develop a continuous synthesis process for metal nanoparticles in collaboration with AIST; this process utilizes the microwave irradiation technology of AIST. The result is supported by "Research & Development project for supporting small and medium enterprises" one of the Product performance evaluation project for small and medium enterprises by the second supplementary budget for FY 2008. The microwave irradiation method is an application of the microwave irradiation technology that was developed by AIST in collaboration with IDX as one of the Research & Development project for supporting small and medium enterprises in FY 2007, named "Development of microwave flow reactors." When a microwave of a specific wavelength is irradiated to a cylindrical hollow metal container, the electric field distribution termed TM010 is formed (Fig. 1). In this cylinder, the electric field strength reaches a peak at the central axis and becomes uniform along the axial direction. We found that when a tubular reactor is installed along this central axis, the catalyst and reactants in the reactor are heated uniformly (patent pending). In general, the electric field distribution of the TM010 mode cannot be kept when the catalyst and reactants in the reactor varied. 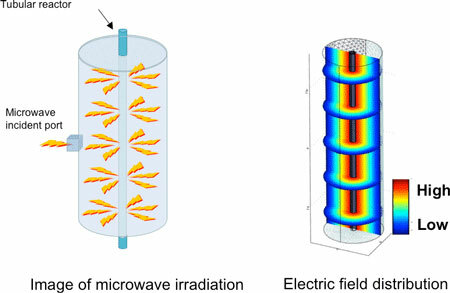 However, the electric field distribution of the TM010 mode can always be kept stable and the temperature in the reactor can be controlled under such a situation when a microwave heater equipped with a variable-frequency semiconductor microwave generator (jointly developed by AIST and IDX) is used. Because the electric field strength of TM010 mode outside the reactor is small and microwave leakage can be easily controlled, this equipment has a high degree of safety. Figure 1: Electric field distribution of the TM010 mode in a cylindrical space. On the basis of the mechanism, we developed a chemical process in which liquid reactants are flowed through the tubular reactor and the continuous fluid undergoes uniform microwave irradiation (Fig. 2). Figure 3 shows a comparison of the heating efficiency of ethylene glycol, a solvent used for the synthesis of metal nanoparticles, between a commercially available microwave heater and the developed heater. It is indicated that the developed heater uses 95% or more irradiated microwaves as heating energy and is a heating system with high energy conversion efficiency. This may be because the electric field strength reaches a peak at the reactor (Fig. 3). IDX is advancing the commercialization of the microwave-based continuous production equipment for organic synthesis, which adopts this mechanism. AIST, in collaboration with Shinko Kagaku Kogyosho, developed synthesis equipment for metal nanoparticles that adapts the microwave-based continuous synthesis equipment. The developed equipment can be operated continuously without maintenance. Figure 4 shows the particle size distribution of silver nanoparticles synthesized by the equipment, and Fig. 5 shows a transmission electron microscope image of the silver nanoparticles. Metal nanoparticles with a uniform particle size were synthesized due to the precise control of microwave irradiation. As the developed equipment performs online measurement of absorption spectra of all products, it would lead to the improvement in the quality of products by ensuring the traceability of the synthesized particles. The equipment can adjust the composition of reactant solution freely and automatically and can easily realize the production of small batches of a variety of nanoparticle products. Moreover, it can automatically optimize the synthesis conditions (such as composition of solutions, reaction temperature, and reaction time) for metal nanoparticles and it therefore can be used for research and development purpose. 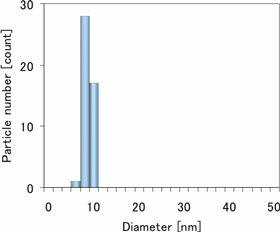 Figure 4: Particle size distribution of silver nanoparticles synthesized using the developed equipment (n = 50). 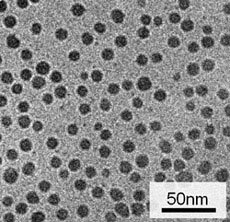 Figure 5: Transmission electron microscope image of the silver nanoparticles synthesized. We will exploit wide-ranging applications of the technology including the syntheses of various organic compounds and medical materials. As this technology involves the use of a semiconductor microwave source, the significant miniaturization of the equipment can be anticipated. The miniaturization allows the equipment to be easily incorporated into various production equipments in which metal nanoparticles are used as raw materials. We hope to contribute to the development of a "green chemical industry" by, for example, making chemical processes more compact, realizing on-site production so as to produce only the required amount of substances (on-demand production) and reducing CO2 emissions through energy savings.